If you’re curious about reflexology or want to find a qualified reflexologist in your area, you’ve come to the right place. If you love practicing reflexology and want to learn more, network with others, and promote your business, this is your place. This is your Network. 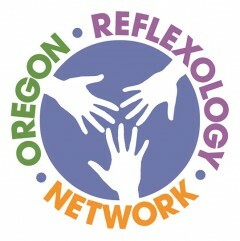 The Oregon Reflexology Network (ORN) is a group of professional reflexologists and body workers, who come together to promote and grow reflexology in Oregon and SW Washington. Our Mission is to be a leader in establishing and upholding the highest standards for the professional practice of Reflexology. Our Vision is to create a cohesive, caring organization that promotes excellence in the practice of reflexology. We accomplish this by providing workshops and other educational opportunities; by presenting reflexology information via emails, newsletters, and website and Facebook posts; by organizing networking events where reflexologists can gather, share information, and support each other; and by promoting community events to increase public awareness of the benefits of reflexology. Members highlighted in color are linked to their city in the referral directory: Rhonda Beckman, Mindi Bender, Shanna Barnard, Diana Blackmon, Heather Boyd, Hania Cennerazzo, Tracey Clarke, John Forsberg, Jill Fox, Linda Frank, Sandra Hachtel, Sue Harrison, Nancie Hines, Anita Hyatt, Pam Jablonski, Leslie Jittu, Susan Johnston, Mary Kingery, Kianna Leighland, Laurie Iris Lerner, Jacqueline Lyczewski, Amy Madlangbayan, Karen Martin, Jackie Maxwell, Elizabeth Merriman, Terrence Miller, Rae Minten, Marie Louise Penchoen, Casey Perry, Cheri Proctor, Mary Pruitt, Cynthia Ramsey, Cindy Rice, Amy Rigney, Sarah Riva, Brita Rogers, Joan Schroeder, Mary Schuster, Lynne Schwartz, Angela Sidlo, Lorna Smith, Sophia Throop, Janice Ulrich, Aryonna Walters.